from the flowers of your special occasion. "Keeping those memories close at hand." Your precious flowers are freeze-dried to preserve the color and remove all the moisture. We combine them with a clay polymer to give them shape and durability. We offer many shapes and sizes of beads . You may choose from several designs of necklaces or bracelets to match your tastes. tie tacks, and cuff links for the guys. 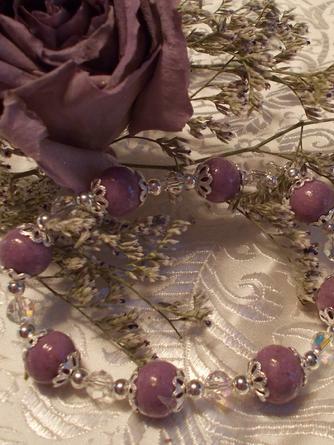 Keepsake Jewelry is made from your flowers according to your requests. How can we help you preserve your memories? Men's choices now includes this pocket knife with the bead material on the handle of the knife, you can order on one side or two. Let us turn your flowers into precious gift full of memories. "Keepsake Jewelry, keeping your memories close at hand." Take a peak at our Bracelets and Necklaces. Men's choices including lapel pin, tie tacks, key rings and cuff links..
What a special way to share a memory with all the family members. but we are often adding new items to meet the needs of our customers. If there is somehing you would like to see please ask.